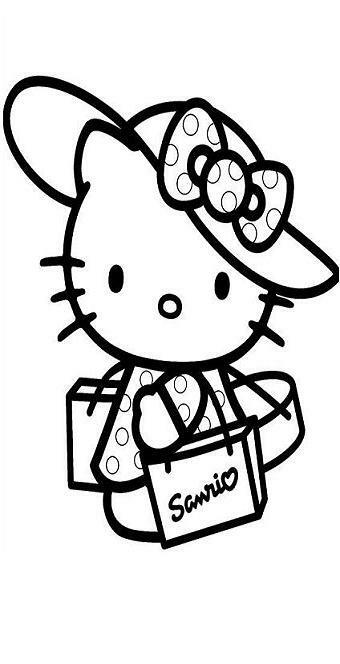 To color the Hello Kitty coloring pages shown on this page, just right click on the image of your choice, and select the appropriate SAVE option from your drop down menu. Doing this will send the image to your picture file. From there, you can reduce or enlarge the images, customize your own design, and adjust the page margins as needed for best printed results. Hello Kitty is a fictional character that made its debut in Japan in 1974, and was first introduced in the United States in 1976. Available Hello Kitty merchandise includes dolls, toys, clothes, accessories, books, DVDs, video games, educational materials, lunch boxes, first aid kits and just about all other products commonly used by children. The Hello Kitty character has been featured in many animated TV series and numerous feature films. There's even a Hello Kitty theme park in Japan and a Hello Kitty restaurant located in Taiwan. These days, the Hello Kitty character is more popular than ever. This probably has more to do with the corporation's marketing geniuses than anything especially compelling about the artwork. Just a few simple geometric shapes comprise this fat white feline with short, rounded limbs, dots for eyes and a big red bow on her head. However, the simplicity of design is one of the character's most appealing qualities, as far as the tastes of small children are concerned. In any case and for whatever the reason, as of September 2012, a Yahoo search for the keyword "Hello Kitty" yields more than 125 million web page results. The cat's "real" name is Kitty White. The Hello Kitty character was originally designed by artist Yuko Shimizu for the Sanrio Company. In recent times, Hello Kitty products make more than a billion dollars each year in sales revenue. To print out more coloring outlines, original artwork, paper crafts, tattoo designs, fashion patterns, geographical maps and other assorted free printable items, visit any of the links shown on this page. Hit this link for More Free Printable Coloring Pages.